Lava lamps are beautiful and fascinating to watch. First graders are sure to have fun watching the colourful activity that takes place inside a lava lamp. 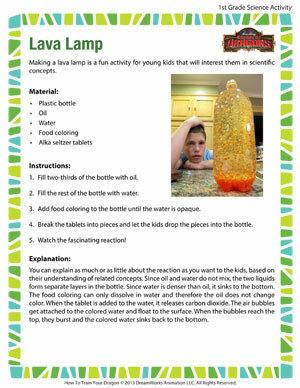 With some alka seltzer tablets, food coloring and oil, you can make a lava lamp of your own. This cool science activity is a great way to interest young kids in scientific concepts and in understanding the explanation behind unusual phenomena.